Simply lovely Debra =) Thanks for your comments! Nice! The drawing and the dish! I see you like your guacamole spicy like I do =) Are those shallots? The blue background will look great. I love guacamole, so I really like this one!! Good thing I look at your blog in the morning or I would be running to the kitchen all the time to eat something after looking at all the yummy things you are drawing this month! 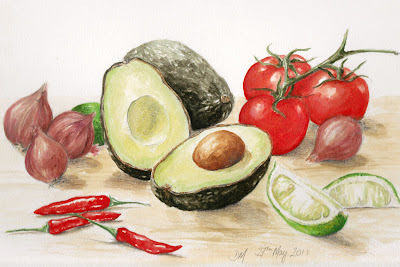 Guacamole is another favorite of mine, I could eat that all day long! Your work really should find place in a cooking book as an illustration, did you ever think of that ? Guacamole is another favorite of mine , I could eat that all day long! Love it! Your paintings really should find place in a cooking book as an illustration. Have you ever thought of that? mmm guacamole great with your chips from yesterday. You have captured the avocado skins perfectly. Even the avocado pit is super! So realistic!